The Works With SmartThings program invites our amazing developers and partners to join the journey to create a fast-growing IoT ecosystem. The SmartThings cloud has been designed from the ground up to support a wide range of devices and appliances in the market. Share your limitless ideas and work with us to find the business opportunity in the leading open platform for IoT. Work with us to build the connected world. Build IoT products. Tools and mentors will support you to build, test, and publish your devices to the SmartThings cloud. Create SmartApps. Develop a rich, connected experience to automate a wide variety of IoT devices, limited only by your imagination. Secure your connected devices using various hardware platforms including ARTIK secure system-on-modules. If you have a new idea to delight customers with connected devices that is yet to be supported by our online materials and tools, please contact here. 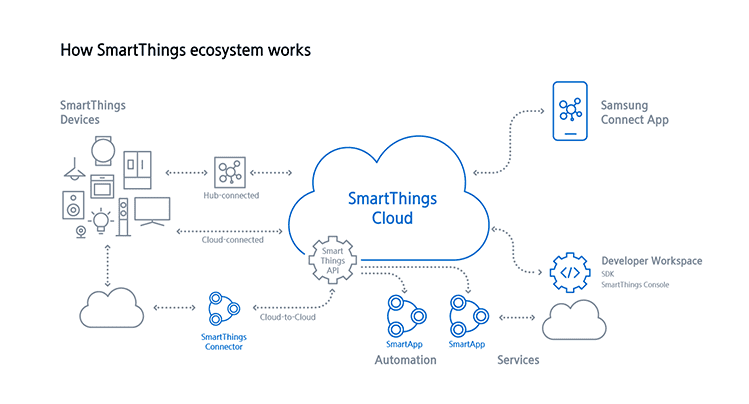 SmartThings API enables you to integrate your own IoT devices and services into SmartThings Cloud. Further, SmartThings API provides methods to control and monitor a variety of IoT devices. Using the SmartThings API, you can create Automations. A morning app that turns on lights and starts the coffee. A romance app that dims the lights and plays soft music. A school night app that turns on parental controls. A weather app that alerts you if it is raining and your windows are open.